For more than 50 years, generations of Houston families have called Forest West home. Through all that time, it has remained one of our city’s best-kept secrets, but not for much longer. As we all know, Houston has been one of the hottest real estate regions in the country. Forest West and other nearby neighborhoods have seen home values dramatically increase as the city’s population increases and people who want to live close to downtown are priced out of inner loop neighborhoods. As a result, preserving the safety and quiet beauty of Forest West has become a top priority of the homeowners association. With homes being bought, renovated and flipped seemingly on a weekly basis, it is imperative that we meet these challenges head on. Over a year ago, a committee was formed to review and make needed modifications to what are fairly antiquated deed restrictions. The committee was formed with volunteers, your neighbors who gave months of their time to help craft new guidelines that will help Forest West thrive for years to come. The result was a total re-write of the original restrictions to better reflect our neighborhood’s changing needs. 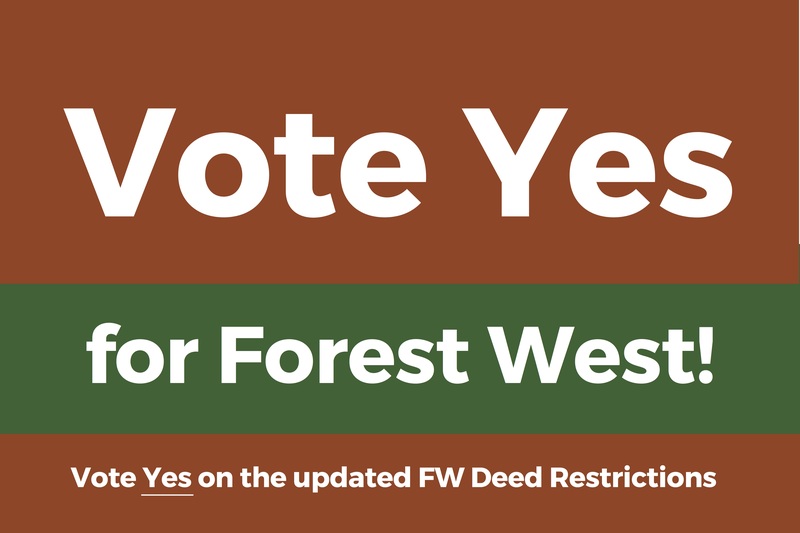 We encourage you to VOTE YES to help us preserve the safety and beauty of Forest West!